Lēʻahi, also known as Diamond Head, is a nearly circular crater of approximately two-thirds of a mile in diameter. Diamond Head is different things to different people: Homes of Hawai‘i’s Kings, Queens and Royal Families were in its shadow; It’s an internationally-recognized visitor industry icon; It’s the backdrop to the famous Waikīkī Beach; It served an integral role in the island military defenses; It is present home and command center for State Civil Defense; It’s an easy walk to the summit for spectacular views of the ocean and coastline and It is a backdrop to a transformation of social, political and religious events. In the legend of Pele and Hi‘iaka, Hi‘iaka is said to have compared Diamond Head to the brow of the ‘ahi: Me he i‘a la ka Lae o Ahi; E kalali au ae nei i ke kai - Like a fish is the Brow-of-the-ahi Resting high above the sea. Other names for Diamond Head include Point Rose (given to the geologic feature in 1786 by Captain Nathaniel Portlock in honor of the secretary of the British treasury), Diamond Hill and Conical Mountain. Geologically speaking, Diamond Head is a dormant volcanic tuff cone, with a variable-height rim surrounding the recessed interior area; the eruption of Diamond Head took place well over 150,000-years ago. The highest point (at 761-feet) on the southwest rim of Diamond Head is known as Lēʻahi Summit (most of the rim is between 400-500-feet.) The crater is on the southern coastline of Oʻahu, approximately one-and-a-half miles south of the Koʻolau range. From at least the 15th century, chiefly residences lined the shore of Waikīkī, and cultivated fields spread across the Waikīkī plain to the foot of the crater and inland to the Ko‘olau valleys. There were several heiau in Waikīkī, of which several were located around Diamond Head. One of Kamehameha’s main heiau (also suggested as a surfing heiau,) Papaʻenaʻena (also called Lēʻahi Heiau,) was situated at the base of the southern slopes. Other heiau in the vicinity include Kupalaha Heiau, which may have been connected with Papaʻenaʻena, Pahu-a-Maui Heiau on the crater’s eastern cliffs overlooking the ocean (the site of the present Diamond Head lighthouse), Kapua Heiau near the present Kapi¬ʻolani Park, and Ahi Heiau on the peak of Diamond Head. In the early years of the 19th century, people tended gardens in the crater and one visitor described finding “an abundance of melons and watermelons growing wild, upon which we feasted”. In the Great Māhele division of lands between the king and his high chiefs, Diamond Head, which lies within the ʻili of Kapahulu in the ahupuaʻa of Waikīkī, was awarded to William C. Lunalilo, the future king of Hawaiʻi (1873-1874). In 1884, the Kapahulu portion of Lunalilo’s Māhele award was subdivided by the Lunalilo Estate. Diamond Head was transferred from the estate to the Hawaiian Government. The summit of Lēʻahi affords an excellent and unobstructed view of the ocean from Koko Head in the east, to beyond the -ʻEwa Plain to Wai‘anae in the west. The utility of Diamond Head did not go unnoticed by the U.S. Army. In 1906, the US government acquired the 729-acres of Lunalilo’s property from the Hawaiian Government, as well as other adjacent lands (including Black Point), to create Fort Ruger Military Reservation, the easternmost of the coastal defense forts. From 1963 to 2001, the FAA had its air traffic control facilities in Diamond Head crater, which guided Hawai‘i-bound aircraft from 250 miles outside the Islands to within 20 miles of their intended airport. Diamond Head State Monument was first officially established under an Executive Order by Hawaiʻi’s Governor Quinn in 1962; nearly 500-acres of land now make up the Monument. This early designation covered about 145-acres in a horseshoe configuration preserving the famous profile and the south and west exterior slopes from the crater rim down to Diamond Head Road. Subsequently, Executive Orders have added additional lands to the Monument. The interior of the crater had been closed to the public from 1906 until 1968. (Remember the Sunshine Festivals In 1976, DLNR’s Division of State Parks became the agency responsible for the planning and management of the Monument – it is now open every day. Two major tunnels (Kāhala Tunnel and Kapahulu Tunnel) provide pedestrian and vehicular access into the crater. Diamond Head is open daily 6 am to 6 pm, every day of the year including holidays, with entrance Fees of $5.00 per car or $1 per person for pedestrians (the money goes to State Parks.) Mountain Biking is not allowed on this trail. No dogs allowed in Diamond Head State Monument. 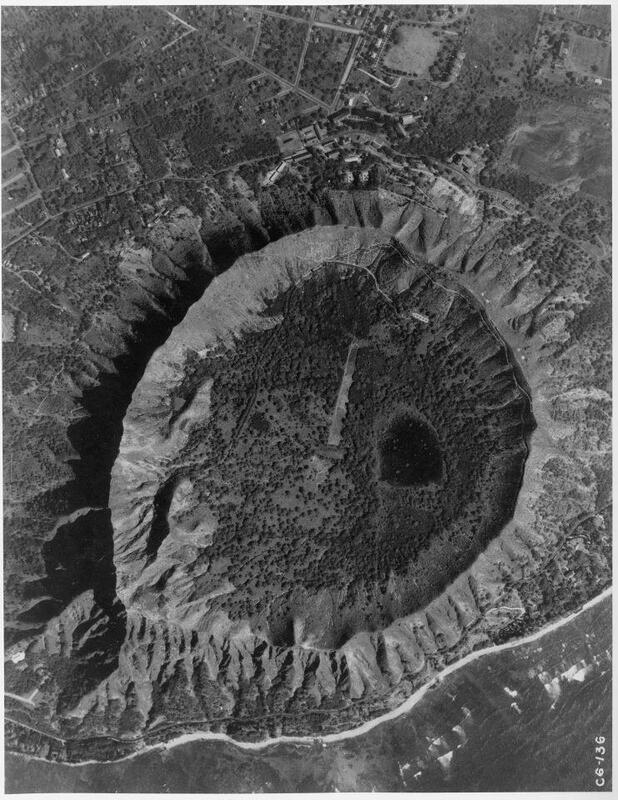 The image shows Lē‘ahi, Diamonds Head, in a 1928 aerial image. I have also added other Diamond Head maps and images in a folder of like name in the Photos section on my Facebook page.